It has a nice crisp look to it. Not too big, not too small. Just right for clipping onto a bag so you can have a watch but not wear it on your wrist. Very nice! The Dakota Watch Company watch clips onto your belt loop, backpack or jacket with the integrated spring carabiner. This digital watch features an alloy case with a stainless steel watch back and aluminum clip house stopwatch, countdown timer, dual time zone function and alarm with chime functions and integrated analog compass. I have found it difficult to find clip watches that are digital. I use the stop watch to grill with so sweep hands are not as useful to me. 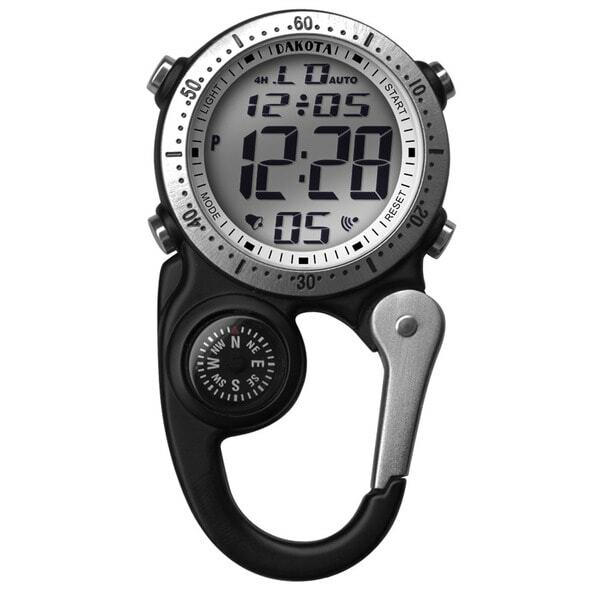 This watch has the typical digital watch functions, clips on easily, is secure, and is stylish. I highly recommend it. I really like this watch foe times when I want to have watch / alarm in front of me and not a watch on my arm or just my cell phone. I use it more often than you might imagine and I love the compass, as well. it is proving to be sturdy and durable too!! Good Brand for clip watches! really convenient for working people! I bought this as a gift for my husband and he has not opened it yet. This will be the third type of Dakota watch that I have purchased for him for fishing. He likes them but the batteries never last longer than a year on them. We will try one more time. This watch is built tough and I expect it to last a long time. The watch is fine for the time, but after several attempts, the alarm will not work! This was a gift. It was just what we were looking for. It was a little difficult to read the functions and hope it will stand up to hard use. I haven't heard how it is holding up. This is a substantial time piece, and my daughter loved it. "Does the BEZEL rotate? If so, since the watch has no hands, is there a display mode moving along the periphery of the face? (If no to either, what's the point of putting numbers on the bezel?)" "I bought this watch for my husband, but we cannot get the alarm to go off. Can anyone please give us insight on how to make this alarm work? Thank you"
Closest to the discontinued Timex carabiner my husband wears everyday. This product was selected for my husband. On his job, he can not always access his phone to check the time and he also works in an industry that does not allow for jewelry on his hands. "What kind of battery does this us Every?" Hello Squirrely1, the battery type is a CR2016 button battery. Please let us know if you have additional questions. Thanks for shopping with us!